When a man is a Traveler, the world is his house & the sky is his roof, where he hangs his hat is his home, & all the people are his family. One of the best ways to experience Italy & her culture is by sitting down for a meal in an authentic Osteria and sampling the local cuisine. Forget what you know about “Italian food,” the Italians don’t think of their cuisine that way. American travelers in Italy are shocked to discover that there’s no such thing as Italian food in Italy. All the dishes and wine are specific to the town or region you’re standing in. And the best meals are taken with local Italians at local, family-run restaurants. This all makes sense when you consider that Italy is really a collection of regional cultures, loosely unified with a common language. The Venetians have a very different culture and food history than, say, the Florentines. And the Florentines are very different from the Napolitani, and the Siciliani. When you’re traveling in Italy, you’ll experience a cuisine that’s unique to each region you visit. In Venice you can enjoy the very Venetian Seppie in Nero, the black-as-night dish of cuttlefish braised in its own ink. 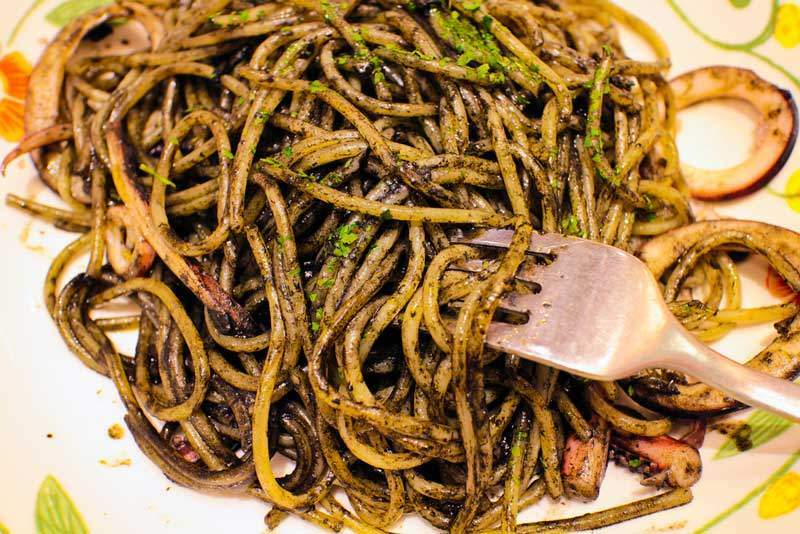 In the Cinque Terre, Trofie al Pesto is tasty potato pasta tossed with green beans & pesto, a dish you won’t find anywhere else in Italy. In central Tuscany you’ll find Pappa al Pomodoro, a tomato soup dish made with day-old bread that is delicious. Each dish is unique to the local area. But wait, I’m sure you’re going to ask “What about pizza?” Well, that’s a Naples dish (Check out da Michele). And focaccia? That’s from Genoa. How about spaghetti with ragù meat sauce? That’s the celebrated dish that originated in Bologna (where it’s served over tagliatelle, and never over spaghetti). Sure, you can find imitations of these dishes all over the planet, but the Italians prefer local dishes unique to where they’re dining and living. The smart traveler knows that these dishes taste best where they originated, having been perfected over hundreds of years of local culinary history. Traveling (and eating) like a local. Try the Italian-only place. If you get a menu written only in Italian, you know you’re in for a treat. Most Italians can speak at least a little English, and many are fluent. Just ask, they will try hard to make you comfortable. Ask for a recommendation if the menu seems confusing. Always make a reservation. The best local restaurants in Italy are always full-up, both lunch & dinner. Ask your hotel to book a reservation for you. Adapt to the Italian daily rhythm of lunch starting at 1PM and dinner starting at 8PM. Your waiter won’t rush you, so when you’re ready for the check, just get their attention and say il conto, per favore (how to say it) or pretend like you’re writing on the palm of your hand. Drink the local wine & try the local hooch. You’ll be shocked how inexpensive wine is in Italy. Ask what’s local and drink it with gusto. Skip wines from other regions, you want local vino that was meant to go with the local food. Step outside your comfort zone and try something you’ve never had. 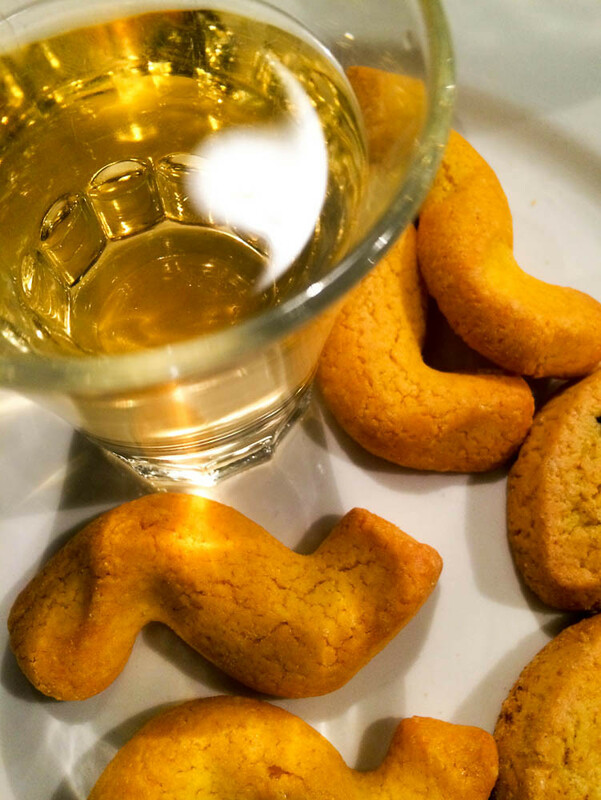 At the end of the meal, try the local digestivo, like an amaro or grappa. Sampling the local hooch is a great way to end the evening. Eat like an Italian (not like an American). Italians eat their meals in courses, so go with the local flow. Antipasti comes first, followed by a pasta dish (primo), then a meat dish (secondo), then salad & veggies (contorno), then dessert (dolce), then coffee (caffè) or an amaro (that bitter post-dinner digestive drink that helps settle your stomach). If you’re like me and you can’t handle that much food in one setting, it’s okay to order any two out of the 6 courses. Oh, and skip the grated parmigiano on your seafood pasta dish. Italians never mix dairy with seafood (think about that, it makes sense). And if you want coffee at the end of the meal, skip the cappuccino and go with an espresso (say “un caffè, per favore” just like this). Better yet, order an amaro. Finding the best restaurants in Italy. 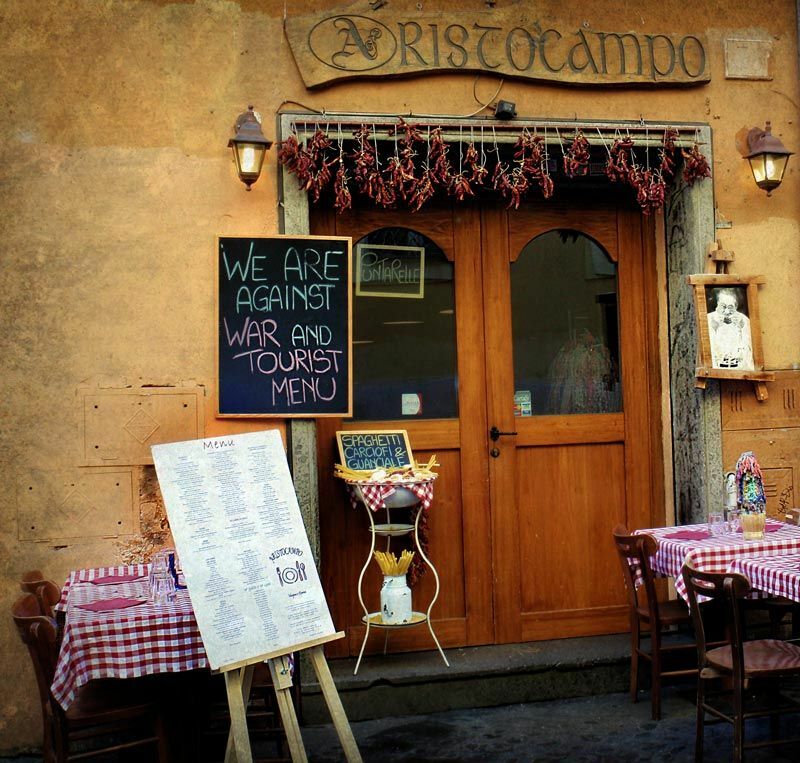 If you want to find the best Ristoranti, Trattorie and Osterie in Italy, just ask the locals. Or you can buy a copy of Slow Food’s Osterie d’Italia (here’s how you say it). 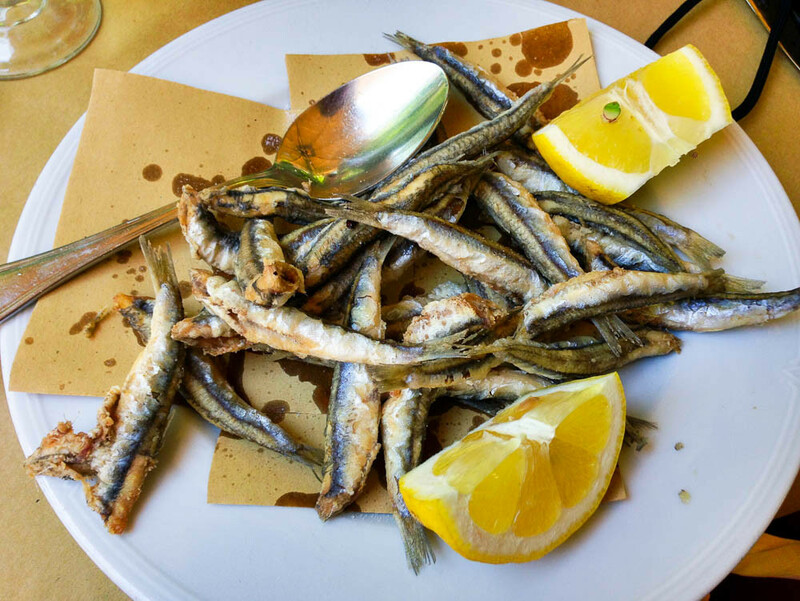 Each year, dozens of restaurant reviewers at Slow Food scour the Italian peninsula for restaurants that best represent authentic local cuisine in each region. In the fall of each year, they publish this handy, compact guidebook to Italy’s best and most affordable restaurants. You’ll learn where local Italians take their meals, allowing you to skip the touristic bland restaurants, eat and drink well, all without paying much money. I buy a fresh copy of this book every year (for over 10 years) and I take a copy of this book with me on every trip to Italy. The latest edition of Osterie d’Italia has a detailed listing of over 1,500 of the best Osterie and Trattorie and some noteworthy Ristoranti (what’s the difference?) sorted by region and city, with maps to show you where to look when you’re on the road in Italy. Each dining establishment lists their address, price, hours of dining, regional food & wine specialties — everything you need to locate, book a reservation, and dine wonderfully at these very special Italian treasures. Sounds fabulous, doesn’t it? Well, there is one catch: It’s written entirely in Italian. You don’t need to know Italian to use this book to find the best Osterie in Italy. The book is organized in such an intuitive layout that anyone can locate and get the gist of what a restaurant offers. Trust me on this one, you won’t be disappointed traveling with this Slow Food guide book. How to use the Osterie d’Italia guidebook. All regions: The book is organized by region, starting at the top of Italy with the Valle d’Aosta and all the way to the bottom with Sicily. 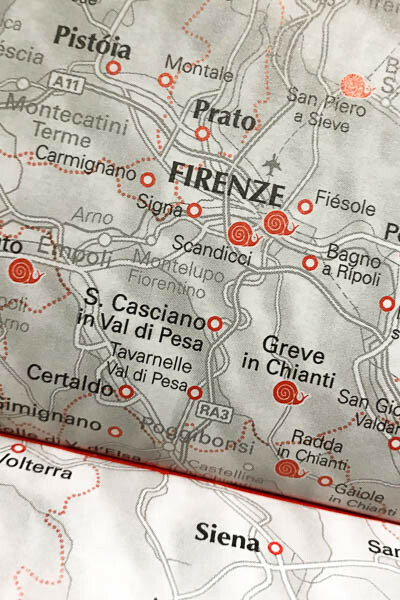 Maps included: Each regional section includes a map of the region that highlights the cities where an Osterie d’Italia “selection” is located. Listed by city: Each region is organized alphabetically by the cities where top restaurants are located. Big cities will have 5 to 10 great listings. Highlighting the best: Slow Food looks for “authentic” restaurants, those that are true to the local cuisine. 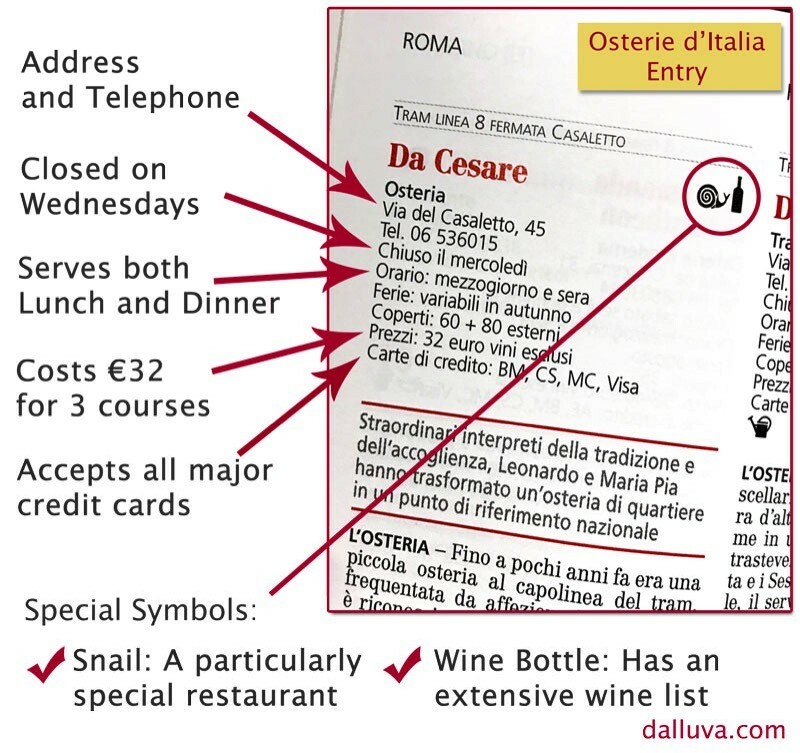 They also award special designations for restaurants that have excellent cheeses (marked with a cheese symbol), excellent wine lists (marked with a wine bottle), and the holy grail of awards, the Slow Food snail — given only to restaurants with exceptionally good food, fairly priced and true to the local tradition. I hunt these Snail gems down while traveling, and I am almost always delighted with the quality of food & service. All the details you need: Each selected restaurant lists everything you need to know about it: you’ll find the name, type of restaurant (Osteria, Trattoria, Ristorante, Enoteca and more), their address & telephone number (remember to always make a reservation), days & times they’re open, how many diners they can seat (some are tiny), typical cost for a 3 course meal, and whether they take credit cards. In-depth menu review: Slow Food does a wonderful write-up of each restaurant, but it’s in Italian. Don’t sweat it, Slow Food highlights the best dishes at the restaurant in red. Pick anything from those and you won’t be disappointed. 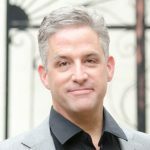 Finding & booking a restaurant. So let’s say you’re planning an Italian vacation and you’ll be visiting Rome. Where’s a great place to eat? Well, there are many wonderful, classic Osterie sprinkled throughout the Eternal City, but let’s say you’re looking for something authentic and extra special. Grab your copy of Osterie d’Italia and let’s start hunting! Find your town. Since we’re heading to Rome, just use the table of contents to find Lazio (that’s the region that Rome is in), then find Roma in the alphabetical listings. Thumb through the restaurant recommendations. For big cities like Rome, you’ll find several listings. There are some great restaurants in Rome, but there’s one that’s a bit out of the way and only frequented by locals & travelers in-the-know: Da Cesare. I’ve picked them in part because they have the coveted Snail award — given only to restaurants that have exceptionally good food and an authentic experience. Pick a “Snail” restaurant and you won’t go wrong. Address & phone number: The address is always clearly listed, and you can easily find it using Google Maps. The phone number listed is “local” — add a +39 or 0039 to it if you call from your cell phone (so for Da Cesare, dial 0039.06.536015). Booking a reservation: Most places listed in Osterie d’Italia are wildly popular with the locals, so you must have a reservation. Show up without one and you’ll be disappointed. Your hotel will be happy to book your lunch or dinner reservation for you, just ask. Getting to Da Cesare: In case you’re in Roma and want to try these guys out, they are just a short distance from the historic center of Rome. You can either take a taxi, an Uber, or you can take Tram #8 from the center of town. Mezzogiorno means “mid day” or lunch, usually 1PM to 3PM. Sera means “evening” or dinner, usually 8PM to 10PM. If it says “solo sera” that means only for dinner. The cost of a meal: Osterie d’Italia lists the approximate cost of a 3-course meal (antipasto, primo and secondo), not including wine, per person. A 3-course meal in Italy is a BIG meal, so you can expect a more moderate (but filling) 2-course meal to be about €10 less. At Da Cesare, the cost is about €32 per person. How you can pay: Most restaurants accept all major credit cards except Amex. However, some places only take cold, hard cash. If it’s cash-only, the entry will say “nessuno,” meaning no cards are accepted. 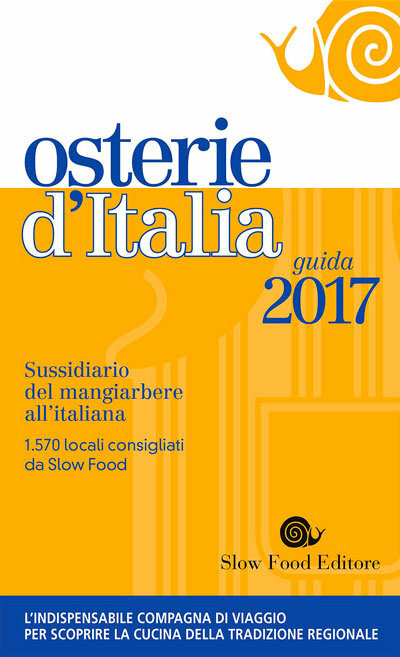 Special symbols: When Osterie d’Italia finds a particularly outstanding restaurant, they give them the Slow Food Snail award. These restaurants are usually outstanding, and Da Cesare is no exception. You may also see a wine bottle (superb wine list), a cheese wheel (excellent cheeses) and a few other symbols defined in the book. Grab a copy and hit the road. Slow Food doesn’t publish Osterie d’Italia here in the States, but you’re in luck: I import hundreds of copies direct from Italy every year for smart travelers like you who want to experience the best regional food Italy can offer. You can check my shop to buy the latest year’s edition. I always recommend that first-time travelers to Italy load up on the guidebooks, and Osterie d’Italia is a great gastronomic guidebook. 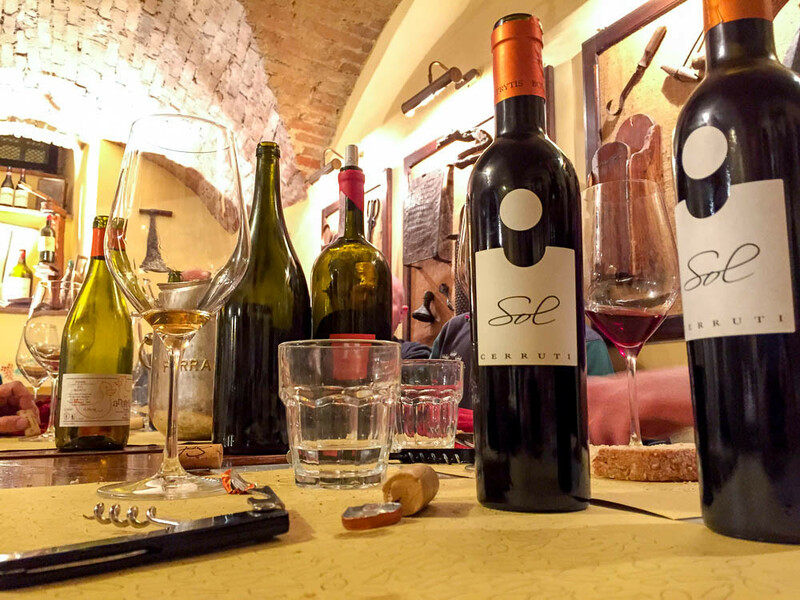 Visit a Venetian bacaro to enjoy the Giro d’Ombra wine pub crawl. Locate the best pizzerias in Naples and taste pizza like Italy intended. Expand your gastronomic horizon with tasty tripe dishes from small shops in Florence (hey, it’s pretty good). This guide gives you the inside scoop on where the best food can be found. You can also get all the content of the Slow Food Osterie d’Italia with their iPhone (or Android?) App, which has the advantage of using the phone's GPS, so it will show you a list of restaurants sorted by distance from you. Presumably they will sell a 2017 version of the app real soon, but frankly these places don't change a lot from year to year. The 2016 iOS app for the iPhone is here. There's another Slow Food app called Slow Food Planet that is in English, and covers more than just Italy, (even parts of the USA) but it seems to only have some of the restaurants that are in Osterie D'Italia. I don't trust it nearly as much. Hey David, thanks for the pointer to the iPhone app. Looks like the Android version for 2016 can be found here. I find that Slow Food is a little slow getting the app out, and it trails the book by ~3 or 4 months. I’m not sure when the 2017 version will be out. I agree that the app can be a great way to carry the recommendations on the road. I find that most Americans don’t have data plans for their phones when they travel, so it becomes a little more challenging to use the mapping feature (you will need WiFi), but most of the good stuff is there and still very handy. Since not all travelers are as “app savvy” with their Smartphones, I recommend the printed book for first time travelers.